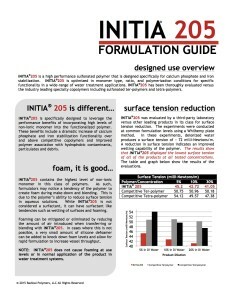 Radical Polymers introduces a new formulation guide for INITIA®205. INITIA®205 is a high performance sulfonated polymer that is designed specifically for calcium phosphate and iron stabilization. INITIA®205 is optimized in monomer type, ratio, and polymerization conditions for specific functionality in a wide-range of water treatment applications. INITIA®205 has been thoroughly evaluated versus the industry leading specialty copolymers including sulfonated ter-polymers and tetra-polymers. INITIA®205 is specifically designed to leverage the performance benefits of incorporating high levels of non-ionic monomer into the functionalized polymer. These benefits include a dramatic increase of calcium phosphate and iron stabilization functionality over and above competitive copolymers and improved polymer association with hydrophobic contaminants, particulates and debris. INITIA®205 is a best-in-class polymer for the stabilization of calcium phosphate, iron, and zinc foulants commonly observed in process water applications. Please contact Radicalpolymers at info@radicalpolymers.com for more information.